Nothing excites me more than visiting a completely new country. Will my imagination match the reality? What will the locals be like? How will I feel when I am there? Will I get enough decent photos for the ‘Gram*? All these questions buzz around my head before visiting somewhere new. There aren’t many things in life that I would get out of bed at 3.45am for, but travelling is one of them. Our flight was scheduled to depart at 6.25am, so I travelled to Gatwick the night before and stayed at the Sofitel Hotel at Gatwick Airport. This was actually my first time staying in an airport hotel pre-departure, and it was delightful. 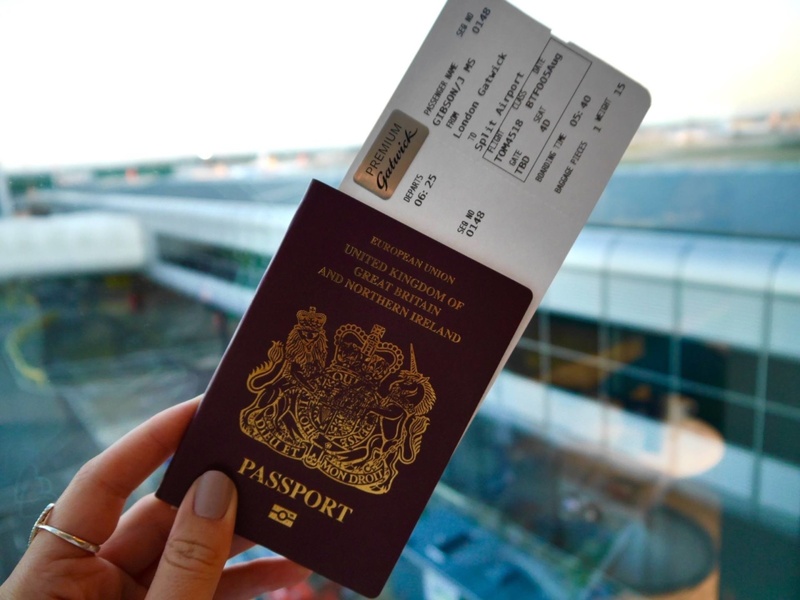 The hotel is quite literally in the North Terminal of Gatwick, which massively reduced the risk of arriving at the airport stressed, late or flustered. I rolled out of bed and strolled into the check-in lounge cool as a cucumber, ready to meet the rest of the group I would be travelling with. Access to Gatwick’s No.1 Traveller Lounge, 2 coffees and 1 complimentary order of eggs benedict later, we were off to a flying start. 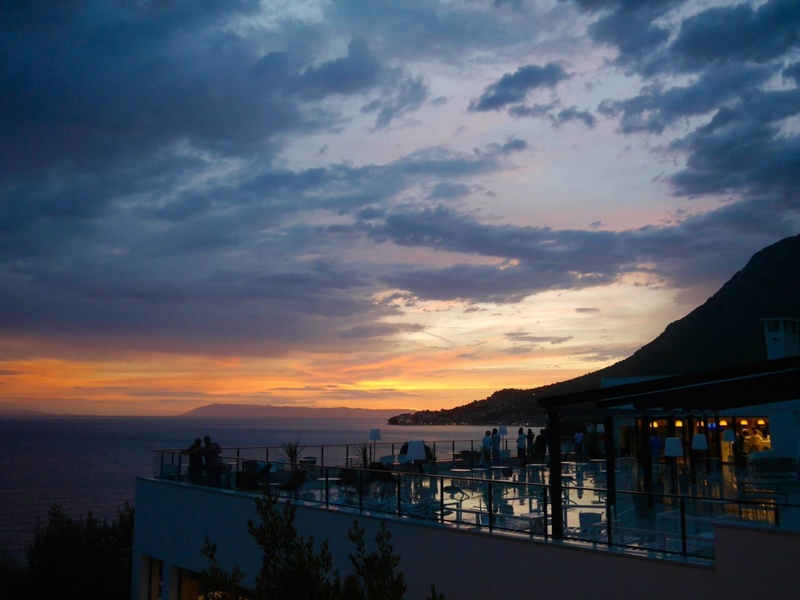 Our base for the long weekend was the Sensimar Adriatic Beach Resort, an all-inclusive, adult only luxury hotel located right on the glittering Makarska Riviera. 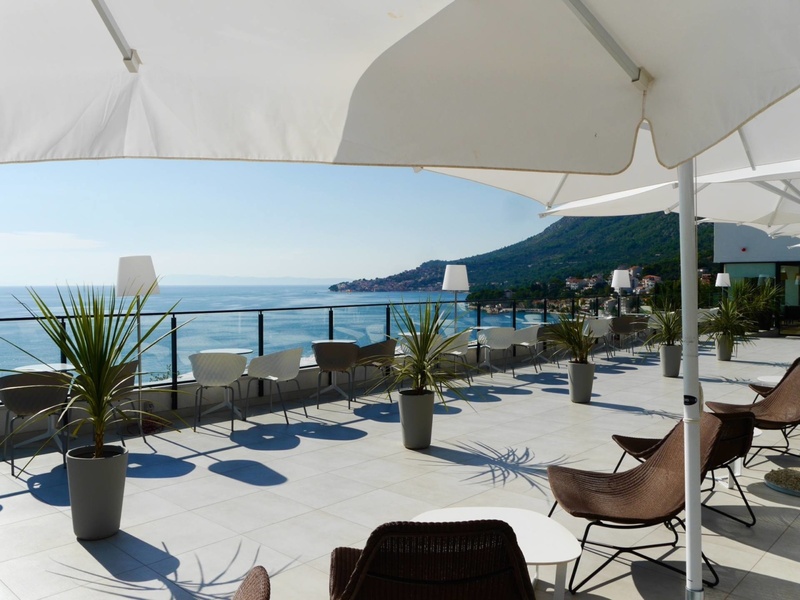 The hotel is located approximately 1 hour 40 minutes away from Split Airport along a spectacular coastal road (so if you arrive in the day time you can expect a journey with incredible views). Walking through the doors of the hotel for the first time was somewhat of a euphoric moment. We were greeted at the door by staff handing out cold scented towels before being led towards the stylish Mojito Bar Terrace. Here we were served icy and refreshing mojitos (naturally) and received our welcome packs. 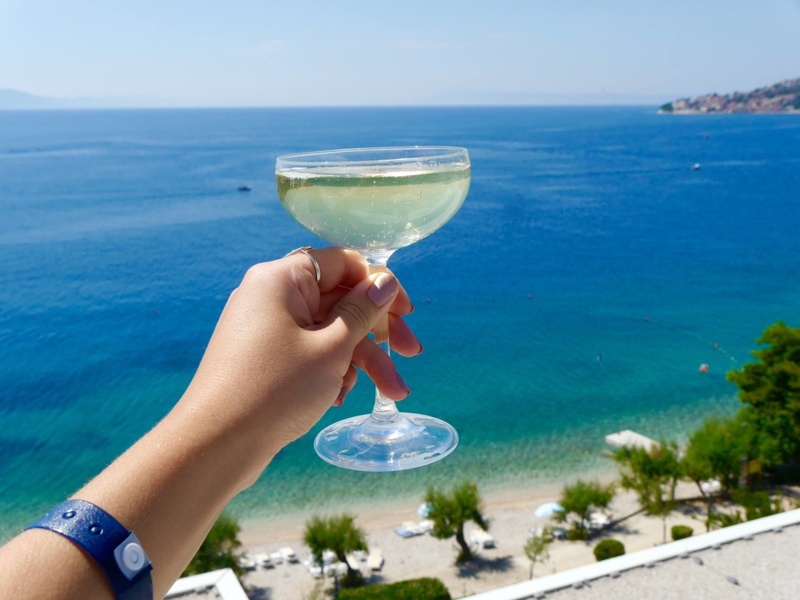 It’s here that you can really appreciate the incredible location of the hotel, with views of the blue ocean, a rugged peninsular, and a faint outline of Hvar Island in the distance. Our first afternoon in Croatia was our one and only time to really spend time at leisure in the hotel. My blissful afternoon consisted of a 30 minute full body massage in the spa followed by an hour stretched out in the sun drinking all inclusive frozen strawberry daiquiris by the pool. I knew we had 2 jam-packed days coming up, so this little slice of ‘me time’ was heavenly. 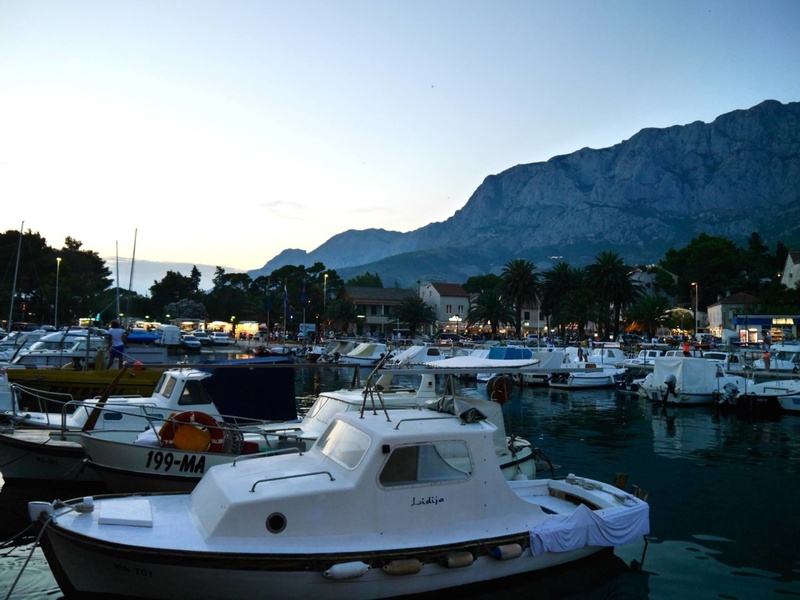 After a blast of Vitamin D, our evening was spent in the bustling port town of Makarska, which is a 30-minute drive away from the resort. The town is well known for its nightlife, with many restaurants and bars and even a nightclub inside a cave if you’re looking to get particularly wild. 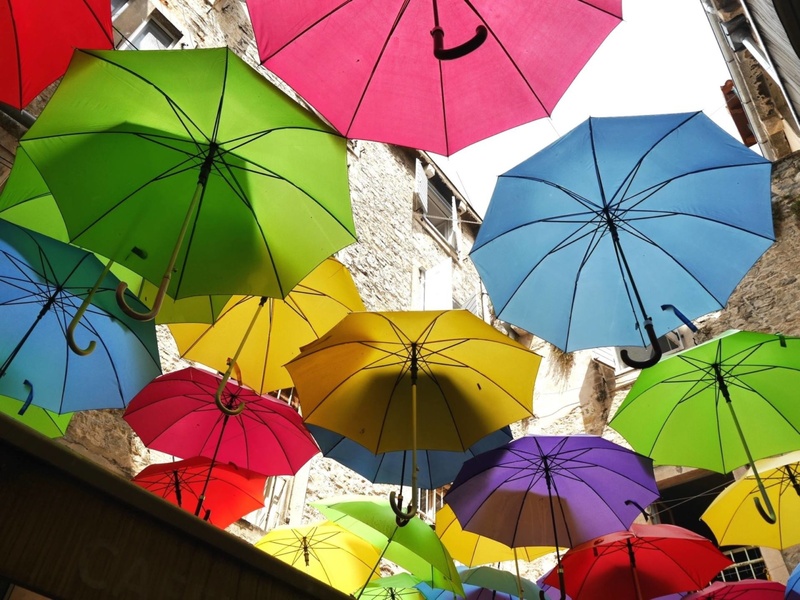 Spectacularly framed by the imposing mountains above, Makarska has the classic allure of a historical Mediterranean port and is well worth a visit. 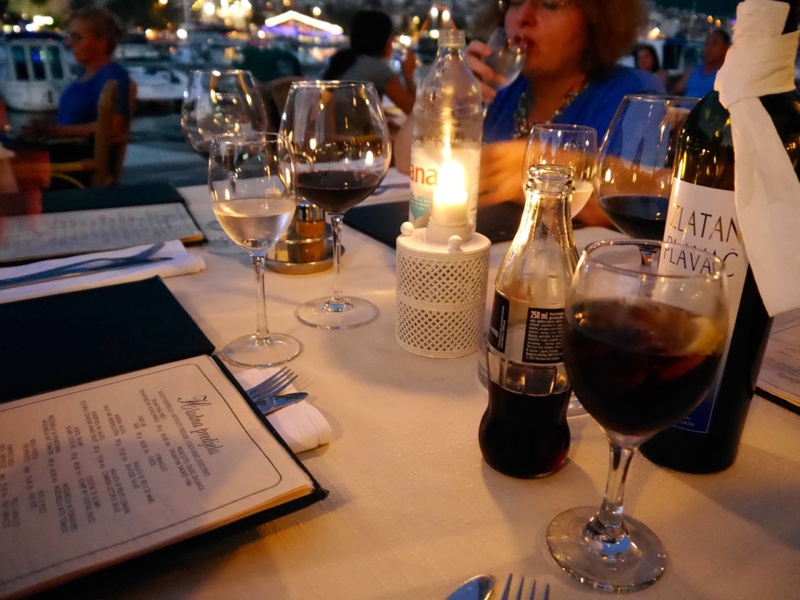 We spent a gorgeous evening at Bura Restaurant, an alfresco waterfront establishment serving fresh seafood and traditional Croatian dishes. We sampled local Croatian red wine, which was full-bodied and decadently delicious. Our first full day began with another early start for our dual-destination day trip to Split and Trogir. This tour was organised by the hotel and is available to all guests staying in the hotel. After a quick omelette served by a very cheery breakfast chef, I grabbed a coffee to go and we set off on our journey. 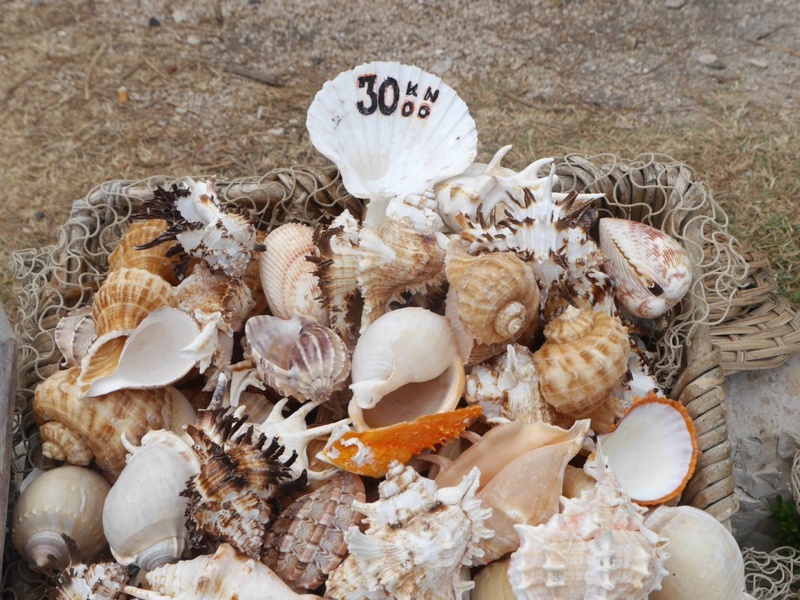 Split is located a 1 hour 30 minute drive away from Sensimar Adriatic Beach Resort, so it can be visited on a day trip. Our friendly tour guide Ante picked us up from the hotel and was with us for the duration. 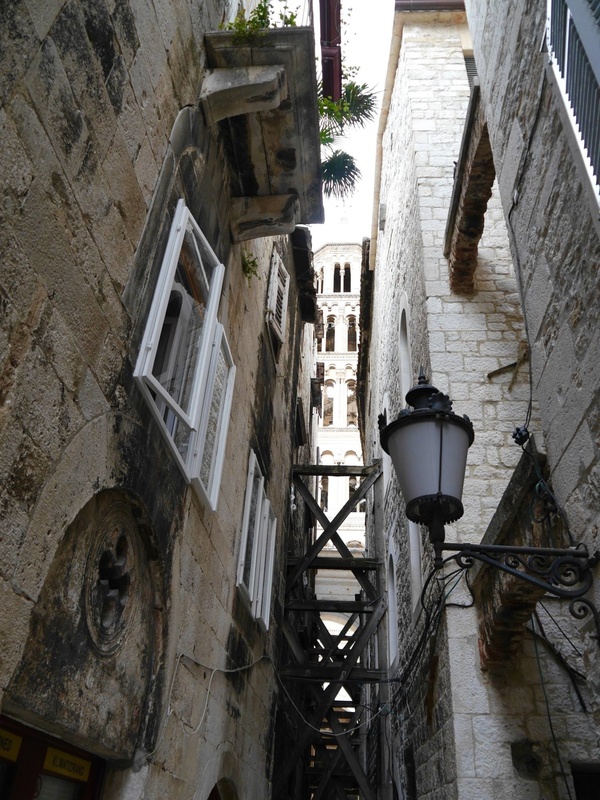 The first stop on our walking tour was 3rd-century Diocletian’s Palace, located right by the port. This Roman walled palace feels like a town in itself. The old living quarters have now been converted into shops, bars and restaurants and you could spend a good few hours getting lost amongst the streets. 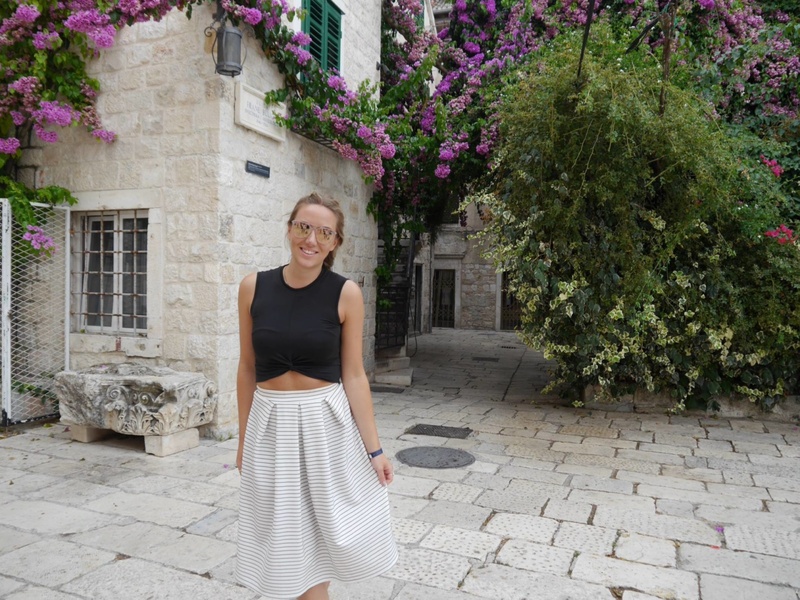 Before visiting, I had no idea how cultural and historic Split would be. I would say it definitely has a feel of Florence and Venice, with its light stone brickwork, cobbled streets, gelato shops and historical architecture. There is endless European charm to discover here. 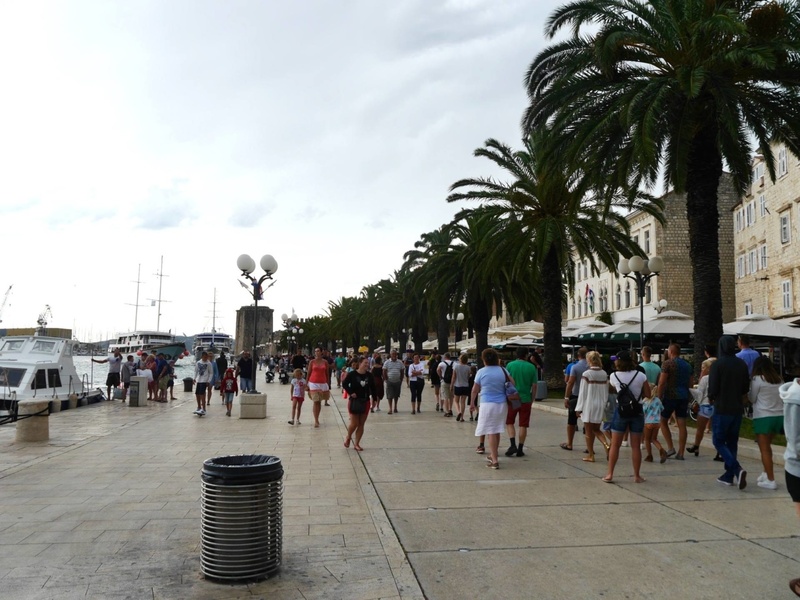 Trogir was another hugely pleasant surprise for me during this trip. 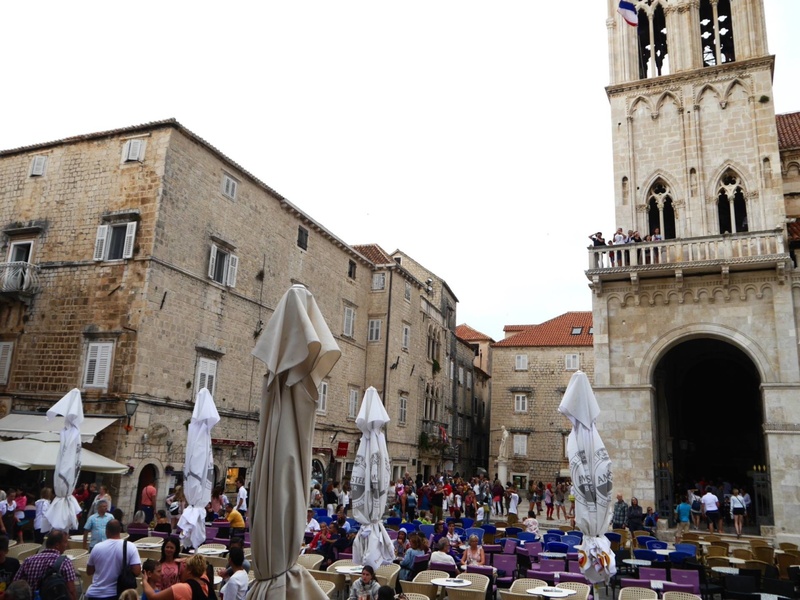 Although I knew of Split and Hvar before the trip, Trogir wasn’t on my travel radar at all. It actually turned out to be my second favourite place on the trip (Hvar taking first place). 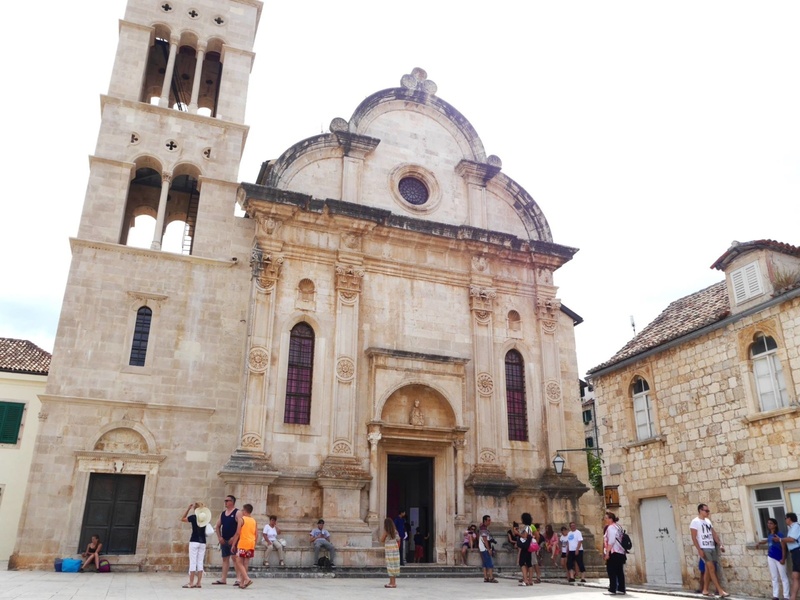 Trogir is home to a UNESCO-listed old quarter stacked with 13th century palaces and churches. In the centre stands a Romanesque-gothic cathedral, with a bell tower that can be climbed by visitors for stunning views over the Riva and town. 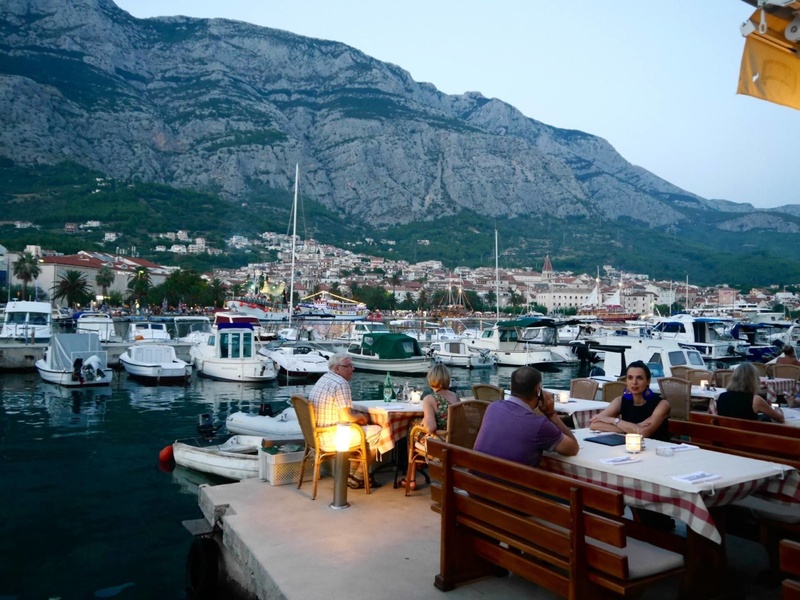 The Riva (the Croatian equivalent of a marina or waterfront) is lined with palm trees, stylish white-tablecloth cafes. 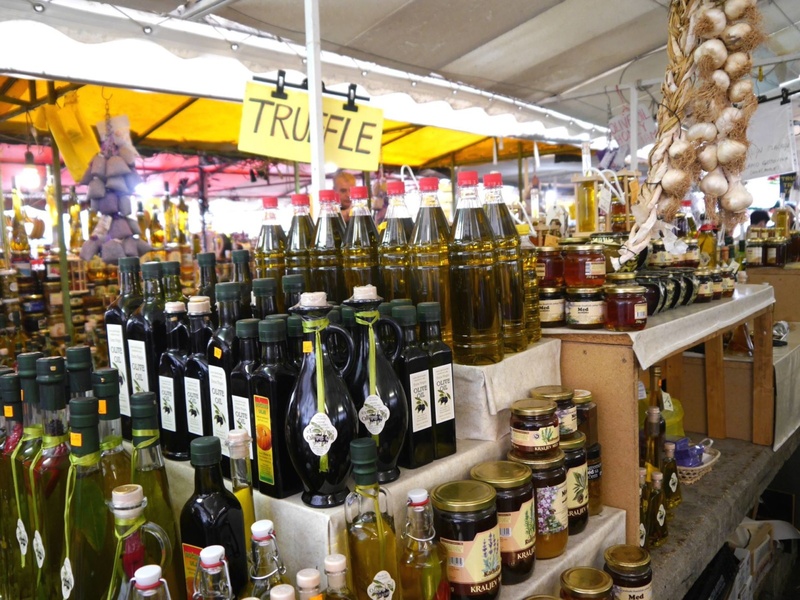 If you want to pick up some local produce or souvenirs, The Green Market in central Trogir is perfect for this. Although we only had half a day here, I would definitely advise allowing at least 1 full day to explore and soak up the atmosphere. 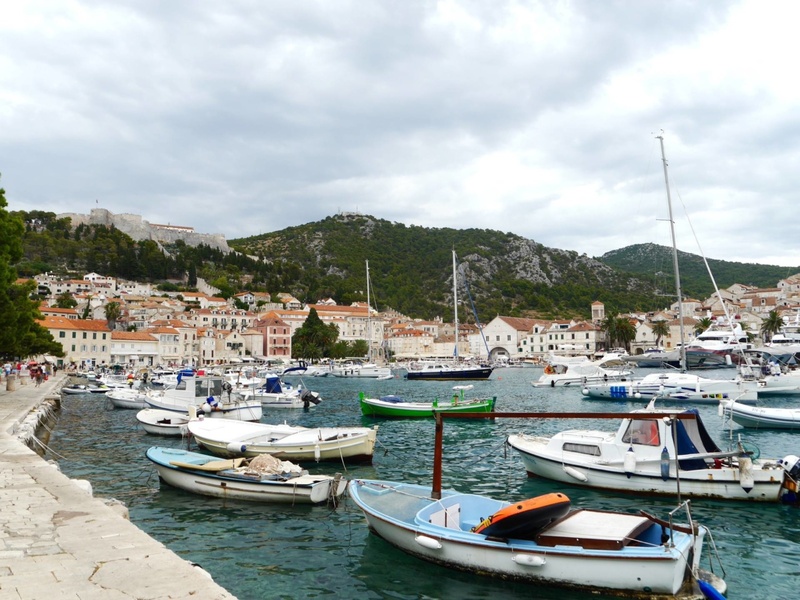 Our final day in was the biggie; a day trip to Croatia’s 4th largest Island, Hvar. 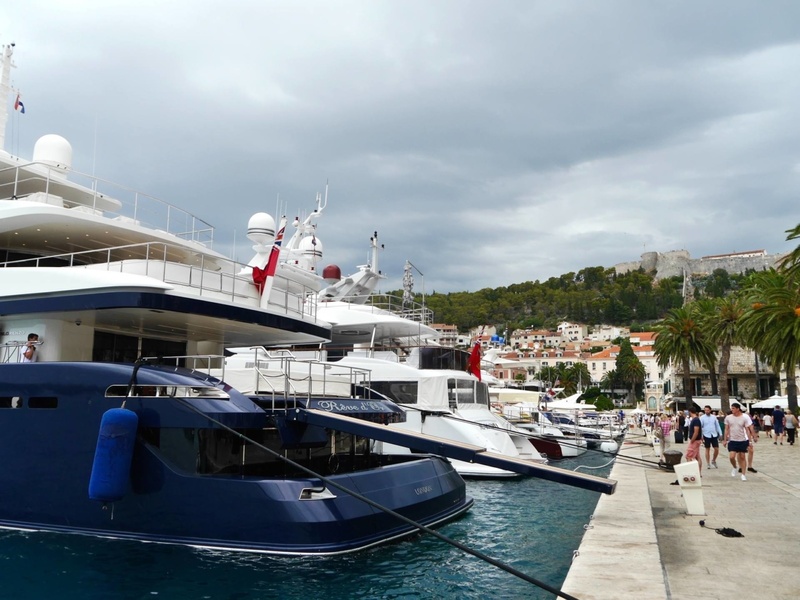 With its super yachts, great nightlife, glamorous people and bustling Riva, Hvar is regarded by many as the St Tropez of Croatia. 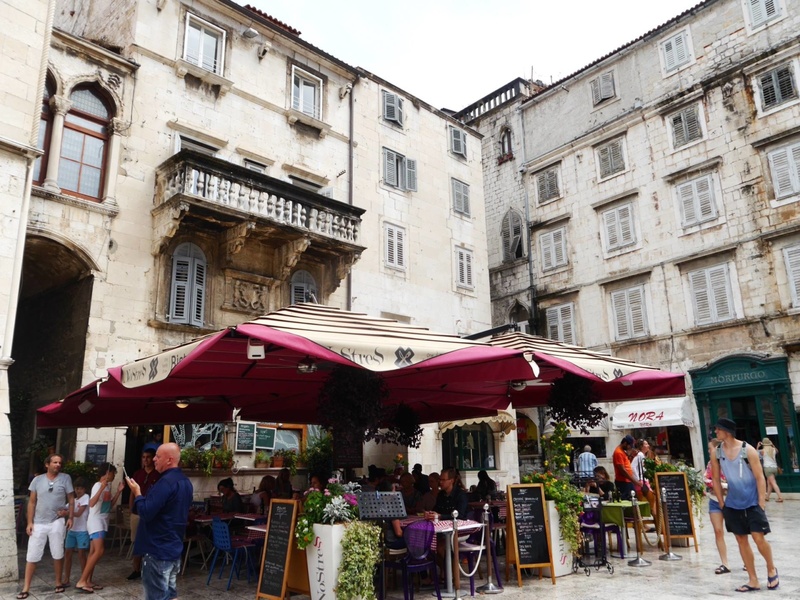 Alongside all the modern glamour is also incredible history, and here you can discover Hvar’s ancient hilltop fortress, a Venetian palace and its café-lined cathedral square. 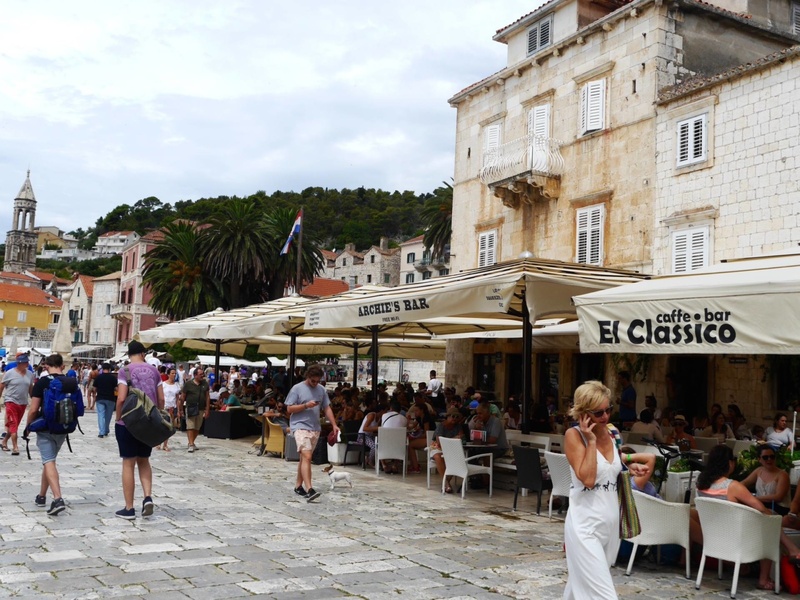 So whether you want to dig deep into the Island’s history or simply people-watch behind a pair of designer sunglasses, Hvar is trending for all the right reasons. 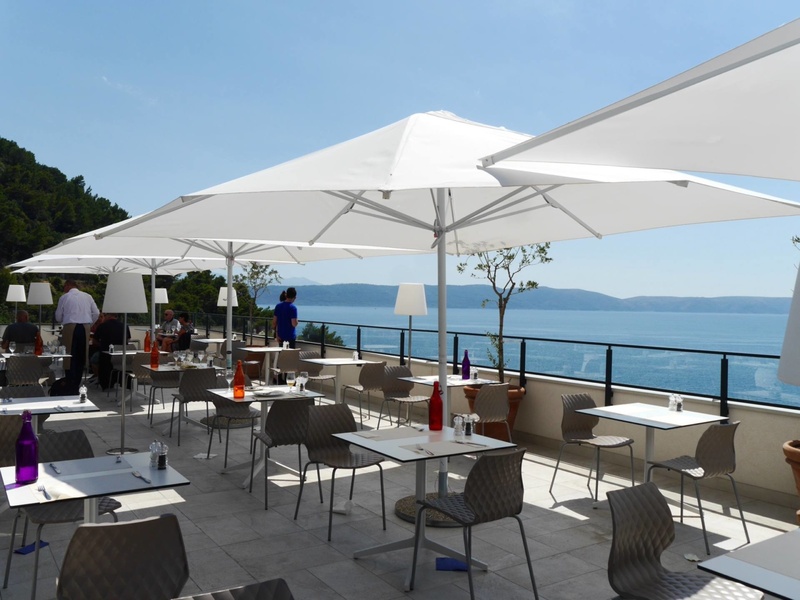 A highlight of the day was our al fresco lunch at DiVino restaurant, right on Hvar’s stylish Riva. 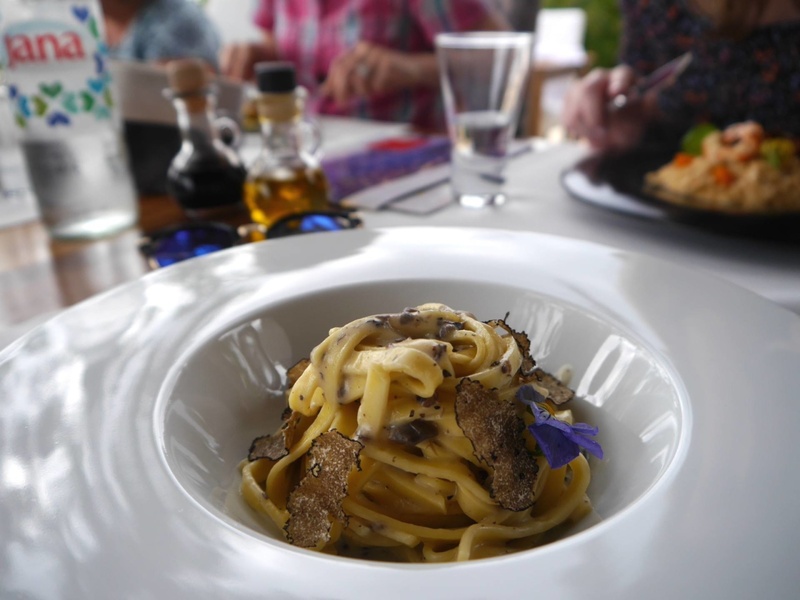 The setting, service and food was absolutely faultless, and I indulged in two of my all time favourite dishes, chicken Caesar salad and a fresh egg truffle pasta. 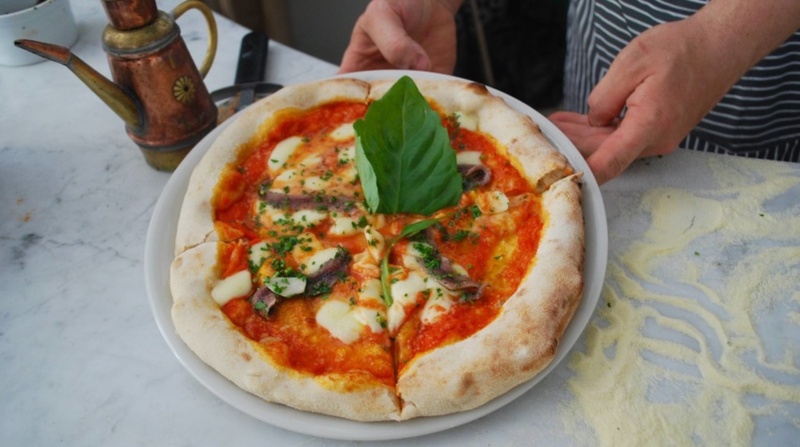 The pasta was rich and comforting and enjoyed even more because of the fabulous surroundings. 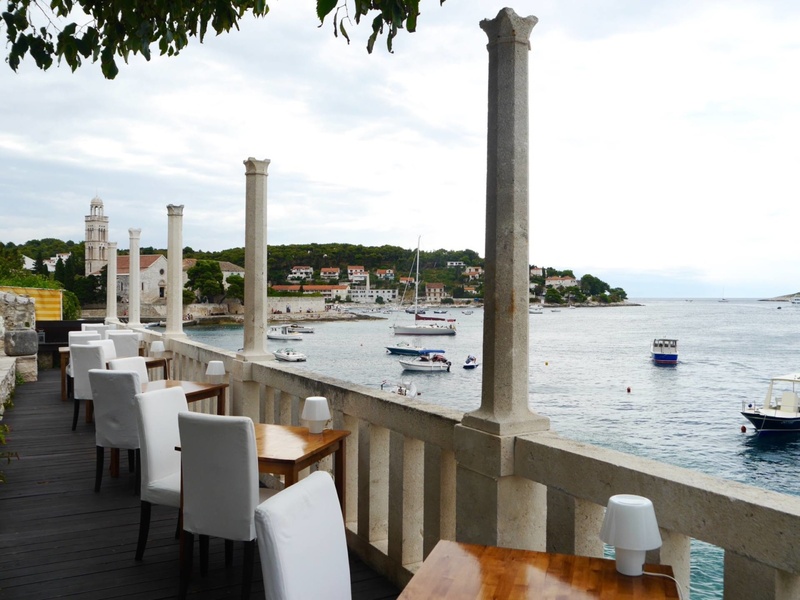 This restaurant is a must visit for anyone planning a trip to Hvar, as well as Hula Hula beach! 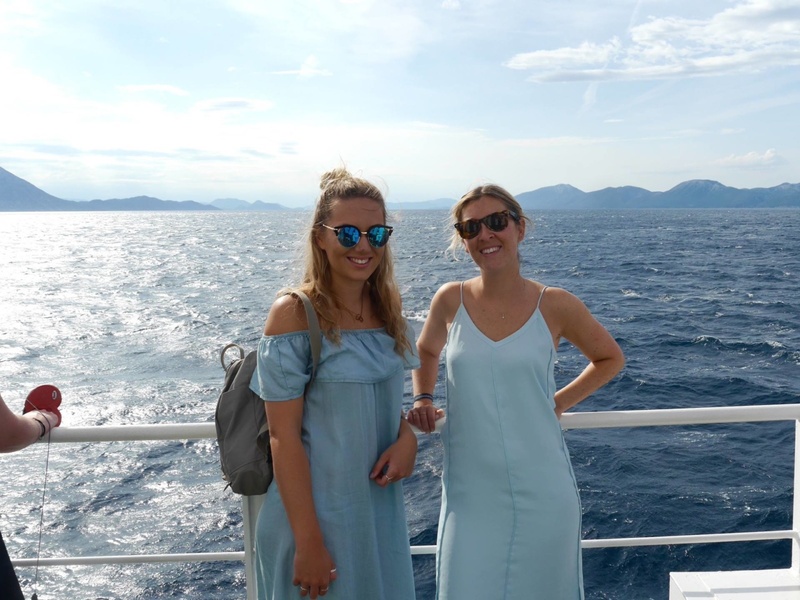 Regular ferry crossings go between Split and Hvar, but we took a ferry from the small port of Drvenik as it was only 10 minutes away from Sensimar Adriatic Beach Resort. Top Tip; The ferries from Drvenik can accommodate 18 cars for each crossing. However, the queues for the ferries are ridiculously long so it’s worth getting down to the port over an hour early to make sure you get on the first crossing. 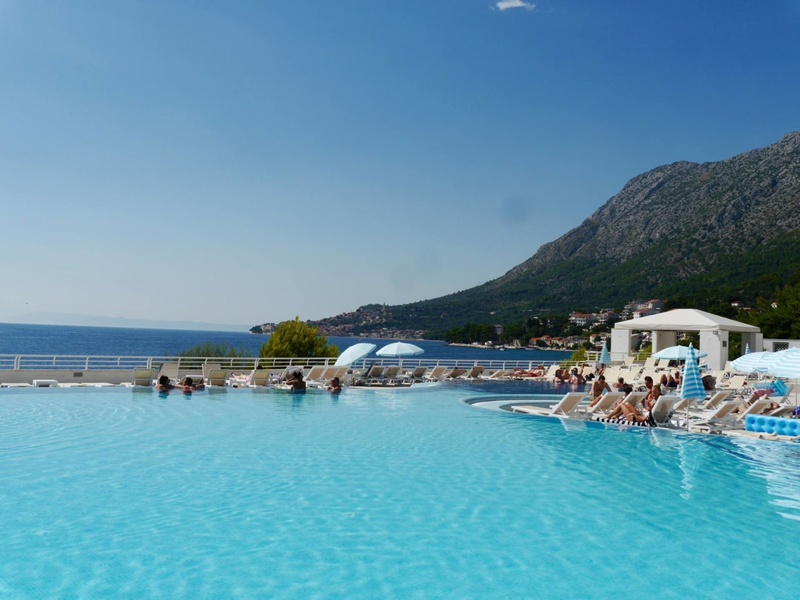 In amongst our busy days of sightseeing, it was an absolute pleasure to spend 3 nights at the Sensimar Adriatic Beach Resort, Thomson’s flagship property in Croatia. Being part of the Sensimar collection means that it is adult-only (huge plus point for me), with a greater emphasis on wellbeing, food and relaxation. From yoga to Nordic walking, there is a weekly programme of inclusive activities designed to keep guests active and exploring. This hotel is perfect for couples looking for a blissful, sun-drenched holiday. 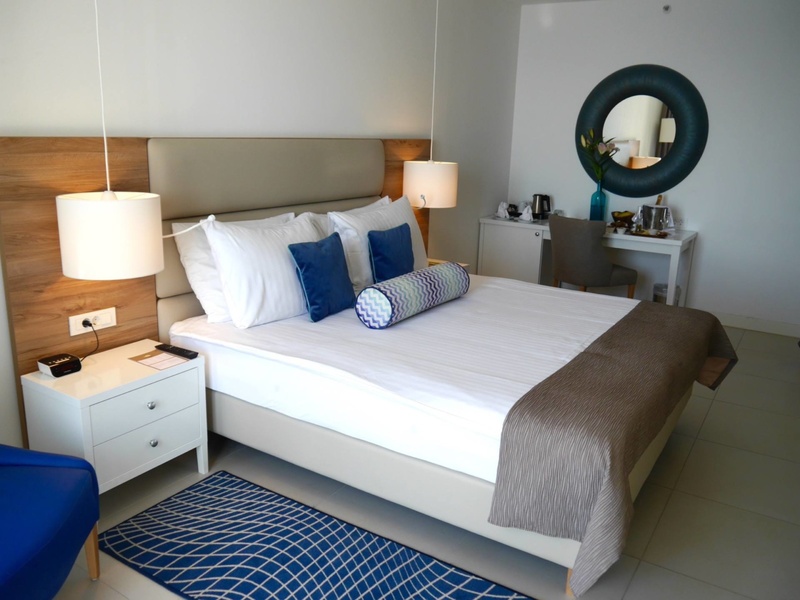 Its price point is realistic and still has all the luxurious touches you’d expect from a 5 star hotel. The staff are incredibly friendly, the food is fantastic, the rooms are luxurious and the location is simply breathtaking. 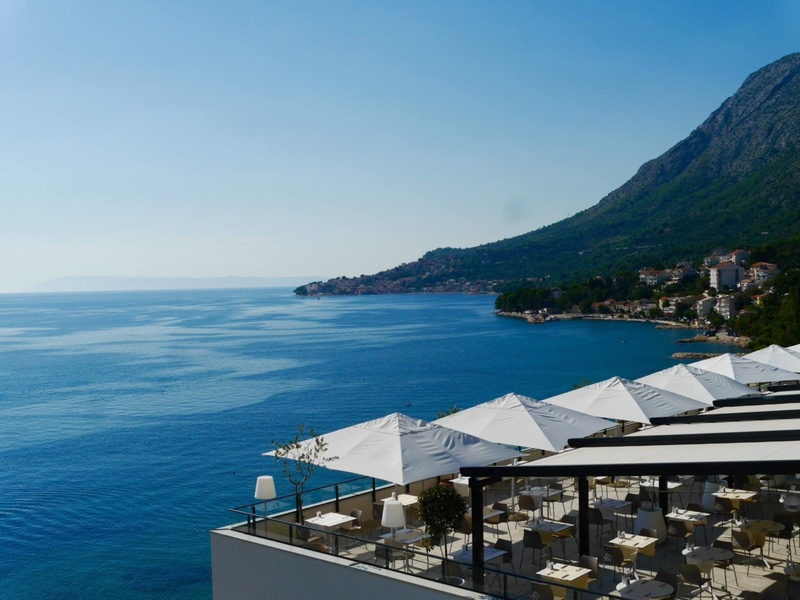 The all-inclusive element of the hotel (including all premium spirits and 100 different cocktails) takes away the usual conundrum of budgeting, but there are still plenty nearby restaurants in Igrane and Makarska if you fancy eating out. The only debatable thing to mention about this hotel is that nearly all of the guests are British. Do with that what you will, but for me, I prefer to see a mix of different nationalities in hotels I stay in. 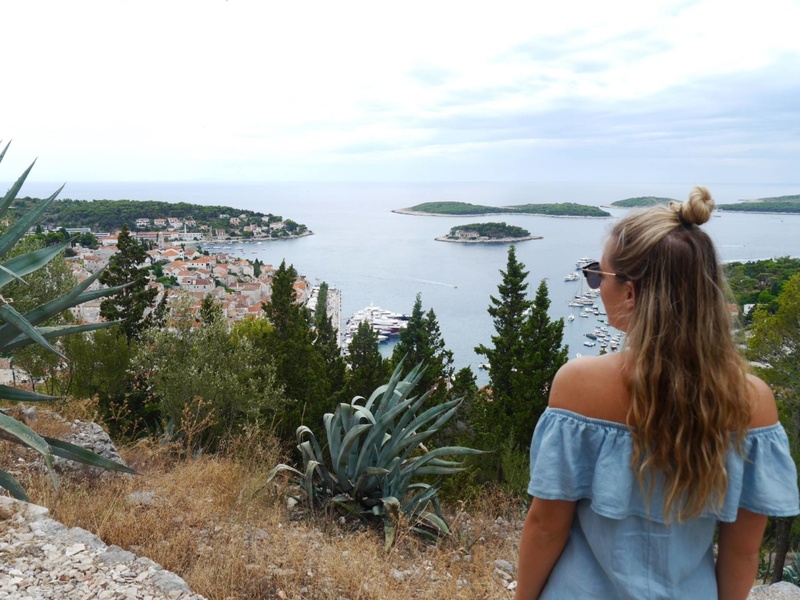 Whilst I only skimmed the surface of what Croatia and its islands have to offer, I loved every minute of exploring this new country. 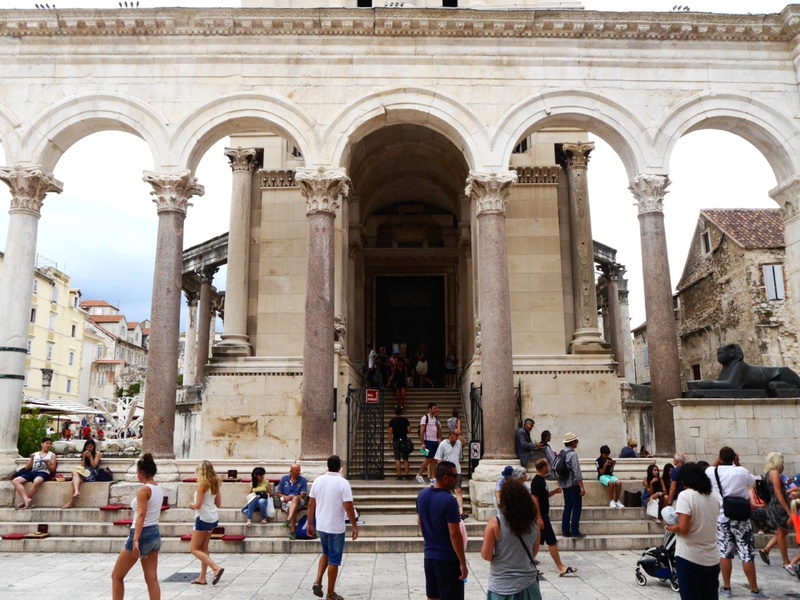 From the plush surroundings of the Sensimar Adriatic Beach Hotel to exploring the magic of each historical town, the trip was a mini adventure of epic proportions. 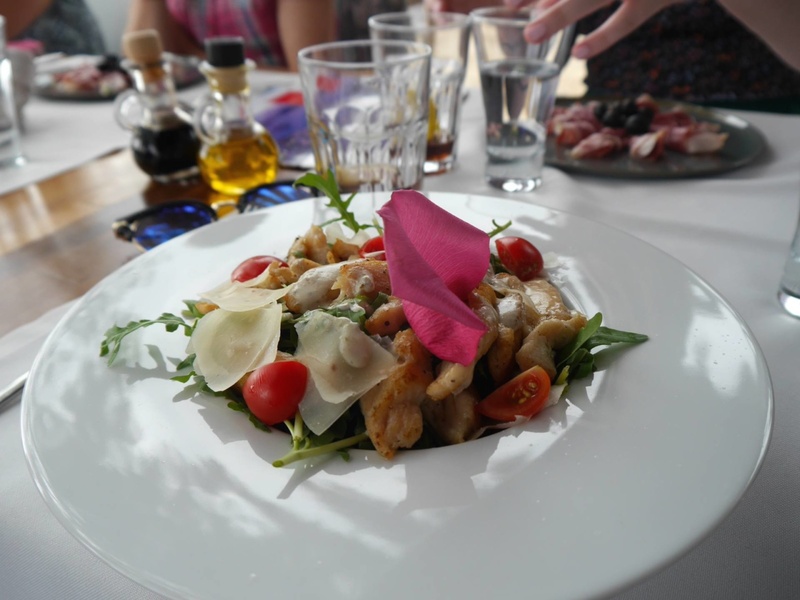 My trip to Croatia was part of a press trip with Thomson Sensimar. All views are my own. Firstly I like to thanks for posting these type of valuable detail. I love reading this blog. Croatia is in the top 10 on my bucket list! I’m just back from Croatia. 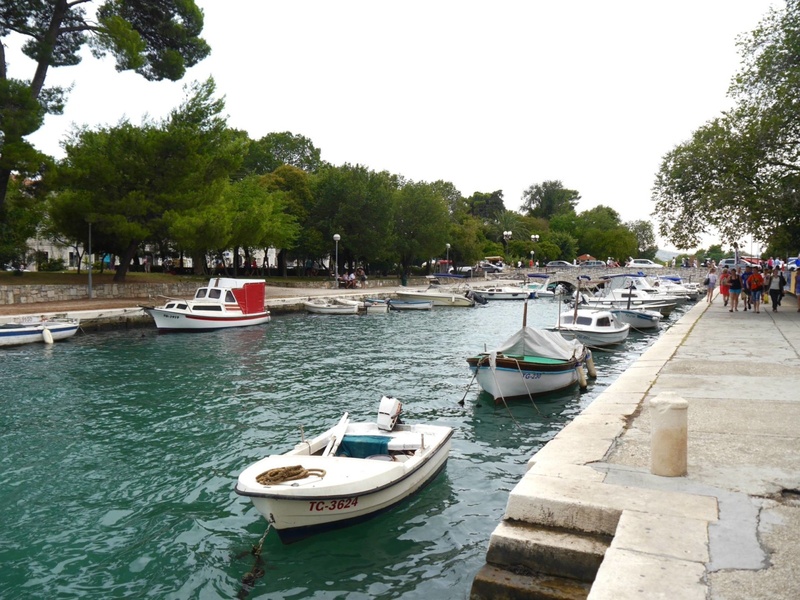 I’d throw in Rovinj, up in Istria, as a must-see, humming town.